one happy little crafter: Something different and a little bit special! Hello, my friends....hope you are having a lovely weekend and have maybe even treated to a little bit of sunshine. Housework aside, have been having something of a lazy weekend. I took Mum to London on Friday to visit the Ideal Home Show, so a rest was in order after a lot of walking. Today's card is a commission from a family friend to mark the occasion of a very special birthday. 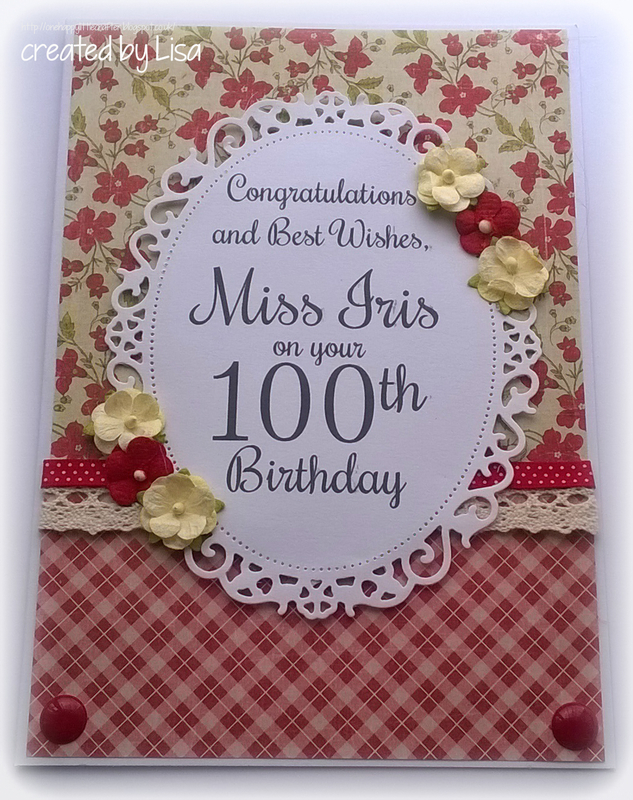 I don't know about you, but in the years that I have been card making, I have never made a 100th Birthday card. thanks again for visiting me today, I have two wee dogs beside me, waiting patiently for a trip to the park, so perhaps I shouldn't keep them waiting too much longer! This is so gorgeous Lisa. This is gorgeous Lisa, fabulous papers and an elegant design - a very special card. I've certainly never made a card for a 100th Birthday - I think I would be a bit nervous about making one! What a Wonderful and pretty card, love the frame with her name and age in, just perfect. I had to make a 101 once, I think that's the oldest I have done. Very pretty card, and display papers reminiscing an era of her time. Great card. Thanks for sharing with Aud Sentiments. Hi Lisa: What a fabulous card, and how exciting that it's for a 100th birthday. Thanks so much for stopping by to share your talents wtih us in our Flowers and Ribbon Challenge. We hope that you will join us again soon. So pretty! Love the classic look. Thanks for joining us at Aud Sentiments, hope to see you again. Beautiful.....a very special card & I love those papers. Thanks for joining us over at Crafty Calendar this month & good luck!